Posted November 16, 2011 by Josette Farrell in News. Work is under way on the new Parish Education Centre at the rear of the Church. The idea of building the centre was ititiated by our museum committee who saw the need for expansion due to a demand for extra facilities. 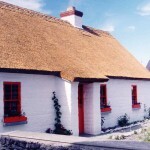 Many local activities are church based and as such, the committee sought approval from the Parish team in providing this accommodation to suit all parish requirements. In 2009, the museum committee looked for planning permission for the centre. A number of stipulations had to be met before work could get underway, which included an archaeological survey, hence the delay in commencing the work. They also applied to Galway Rural Development for a grant to finance the work and this was approved some time ago. The grant promised by Galway Rural Development will not cover the total cost of the building so the committee will run a number of fundraising events to help raise finance to cover these extra costs. The new centre will be of huge benefit to the community as it will be multi-functional. We are appealing to parishioners to support us in our efforts. Nothing can be achieved without collective goodwill and support. ‘Ní neart go cur le cheile’. Lackagh parish is lucky in that it has received grant aid from Galway Rural Development on two concurrent projects. To follow progress on the project, visit the home page on the parish website at www.lackaghparish.ie for regular updates.